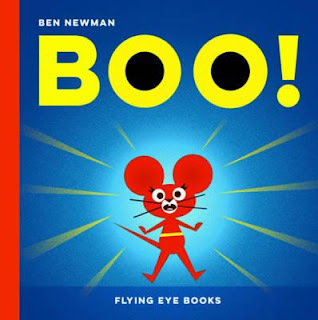 Kids' Book Review: Review: Boo! Feeling scared is so subjective. What scares you may not scare me. What scares her may not scare him. And, of course, what scares an owl may not scare a tiger. In this clever book, Ben Newman takes us through a variety of animals as they realise they're not so fearless, after all... there's always something bigger than us, perhaps more fearsome that us, and that none of us are immune to feeling vulnerable! Each critter is, of course, convinced they are the bravest, most fearless animal on the face of the earth, but quickly learns that's not the case. The bully is ousted, the cocky is quashed, the ego maniac is taken down a peg. And it's funny every step of the way. Kids love high-antics humour like this. They love the drama of suspense and reaction. Ben Newman's striking graphic design-style illustrations are the perfect foil, along with dramatic typography, for this fun and funny tale. Perfect for reading aloud to groups, kids as young as three or four would particularly love this book.